Please note each tab is dedicated to a very specific activity. Two Seminars are planned now, and many more on the way. 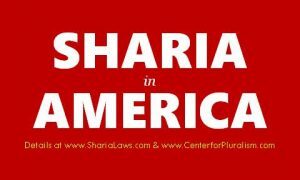 DO AMERICAN MUSLIMS WANT SHARIA? Limited Seats, book yours now. The word Sharia scares t he devil out of some people. Many of them really don’t know why, and they have no answer. Whatever they know is quoted by someone else or learned from faulty news agencies. American Muslims owe it to fellow Americans to clarify the myths about Sharia. We hope to mitigate this fear through a conference with the Imams and Islamic scholars on the one hand, also those who make it their business to oppose Sharia on the other hand. Let’s “clear the air” of misunderstandings for all Americans. We need to put this fear behind us and focus on prosperity and living our lives. Sharia is not coming to America nor do American Muslims want the kind of Sharia practiced in Saudi Arabia and Iran. American Muslims uphold, protect, defend and celebrate the values enshrined in our American Constitution. Our faith reinforces the idea of one nation with liberty and justice for all. A Democratic and a Republican Congressman will preside over the event. A full version is available to serious sponsors. 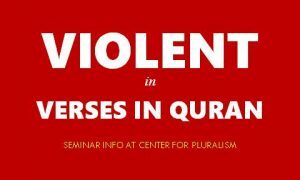 If you believe Quran teaches violence, this seminar is for you as it may release you from the anxieties that come with misinformation. This seminar is also for Muslims who are skeptical about Quran and need a healthy dose of confidence. The purpose of this seminar is to facilitate fresh thinking and removing misunderstandings so we all can live in peace and not live in apprehensions. This event is not to promote Islam. Our policy at the Center for Pluralism is to treat all faiths equally and with full dignity and no faith will be given any preference. Some of us are misled by two of the nearly 50 Quran Translations, which were a product of politics and not Islam. In the middle Ages, European leaders commissioned a hostile Quran translation to foster warfare against Muslim invaders. Later, Muslim leaders produced another translation to inflame Muslims against Christians and Jews. It was all for politics. It is time to identify the problems, clarify them and start living our lives. If you wish to hold on a topic that is dear to you, give us a call. There is a possibility that we may do some of the programs as a television show, and some on the Capitol Hill and hope to hook up with C-Span and other TV networks.